Board of Regents Chair Matt Fleury, left, and President Mark Ojakian at a recent board meeting. As the governing board of the state’s 12 community colleges meets on Thursday to vote on a revised version of a plan intended to merge the schools into a single accredited institution, some faculty and former officials remain opposed — while slightly softening their disapproval. The moderate change in resistance comes after Mark Ojakian, the president of the Connecticut State Colleges and Universities system, released the new pitch to the CSCU community earlier this week outlining proposed changes to the controversial plan. Serafin Mendez-Mendez, a professor at Central Connecticut State University, said the new proposal is a lot better than the state Board of Regents’ previous plan, but officials should still gather more input from faculty. The revised plan would push back the merger of the 12 schools to 2023, create a regionalized structure with three different presidents, and save an estimated $17 million compared to the $23 million originally proposed. In his letter, Ojakian said officials met with the National Center for Higher Education Management Systems, and CSCU faculty and staff in reassessing the proposal. 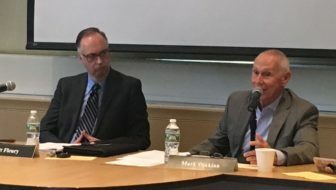 Ojakian said the new plan would “develop a more gradually paced academic planning and transition process, and maintain the current department chair structure.” It would still align curricula for more than 200 degree programs, but gradually shed 117 administrative positions compared to 163 proposed in the first plan. The plan also would establish a common General Education curriculum. The new pitch comes after the New England Association of Schools and Colleges (NEASC), a regional accrediting body, rejected the original proposal in April. NEASC Chairman David P. Angel wrote to Ojakian that the commission didn’t believe that plan was realistic. CSCU faculty and former presidents have voiced months-long opposition to the plan while the BOR has persisted in trying to implement it. Those resisting the plan have raised concerns about campuses losing their autonomy, personal fabric and community connection, and that student services would suffer. Cathryn Addy, the former president of Tunxis Community College in Farmington, said she is concerned the regionalization will add another layer of decision-making and questioned if all options had been explored. Addy said she supported giving the process more time and reinstating department chairs, but maintained her other concerns and doubted the plan would save money. The management structure proposed for the 12-college merger. The new plan would direct officials to hire three regional presidents in the spring of 2019, but still maintain the 12 college-based chief executive, chief financial and chief academic officers. Mary Anne Cox, the past chair of the Middlesex Community College Foundation, said she fears it will result in lost services for students despite the newest plan delaying the merger for five years to deal with past shortcomings. Cox noted community colleges serve the largest amount of undergraduates in the state. “Clearly, they are facing a terrible problem, as many state agencies are, but it really comes down to a question of what the value of public education is,” Cox said.